History: Bea had been hanging around a garden for about a month before the householders were able to catch her and call us. Diagnosis: On examination we found dried blood on Bea’s wing suggesting she had been caught by a cat at some point. There was some nerve damage to her wing which happily resolved in time. 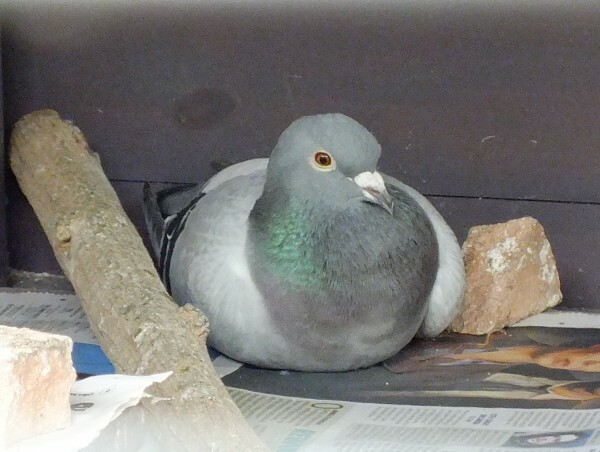 Due to her age, we were unable to trace Bea’s owners (not many racing pigeons live as long as she has sadly). Sometimes racing pigeons can be rehabilitated and join a wild flock but given Bea’s wing issue and age we felt she would be best staying her as a permanent resident. She lives happily in our aviary and has paired with Galega. If you would like to sponsor Bea’s care you can find out how here.